Calamity at the Continental Club ($15.95, 272 pages, ISBN: 978-1-60381-335-8), by Colleen J. Shogan, is the third Washington Whodunit: a cozy mystery series set in Washington D.C. featuring amateur sleuth Kit Marshall. Kit and Doug do their best to clear his father of murder and discover who is really responsible for killing the Continental Club’s darling, conservative multimedia tycoon Grayson Bancroft. “Diverting [….] Interesting and informative trips to such historical sites as Mount Vernon, the National Archives, and the Smithsonian add spice to this appealing whodunit.” Read more…. “Readers who enjoy American history will appreciate this light mystery, including tours of Mount Vernon, the National Archives, and the Smithsonian.” Read more…. 5 Stars: “A spectacular addition to the series, the pace, plot, and characters all develop steadily over the course of the story. The mystery itself will keep the reader guessing until the end, while having a logical course to follow. The minor romance thread continues to move on from where it left off in the previous book with a happy conclusion in sight. Furthermore, the story also has some of the funny and ridiculous moments that made the first two books pop.” Read more…. “Calamity at the Continental Club is a fun read and moves fast. Shogan injects humor into the story, through the first-person thoughts of Kit Marshall. [….] Shogan, familiar with the Washington, DC, museums and restaurants, freely shares her knowledge, bringing the reader more closely into the settings. For those who enjoy a quick read with a satisfying ending, put this on your shelf!” Read more…. 5 Stars: “A wonderful lazy afternoon read. It’s a well-constructed story steeped in interesting details about Washington D.C.—its buildings and monuments. The writing is breezy, humorous, and easy to follow. I enjoyed the banter between the characters.” Read more…. 5 Stars: “Entertaining from start to finish, and since Ms. Shogan was trained in political science she adds details that make the story seem even more real. If you’re a mystery fan you’ll like this one.” Read more…. “This book was such a fun, exciting, and intriguing whodunit. I thoroughly enjoyed reading it and solving the case alongside Kit.” Read more…. “Calamity at the Continental Club is a fun, quick read. [….] The protagonist, Kit Marshall, is well-written, believable, and easy to like. [….] The climax is great! Kit and her co-conspirator Meg solve the murder in a most clever and unusual manner.” Read more…. “This fun cozy mystery provides an entertaining armchair tour of several historically significant areas of D.C. while detailing the machinations of the jockeying for position and power in a historical society.” Read more…. “The third novel in Colleen Shogan’s outstanding Whodunit series, Calamity at the Continental Club once again reveals her genuine mastery of the genre. A consistently compelling and entertaining read from cover to cover, Calamity at the Continental Club is unreservedly recommended to the attention of dedicated mystery buffs and will prove to be an enduringly popular addition to community library Mystery/Suspense collections.” Read more…. “Mystery and history can go together like peanut butter and jelly in this suspenseful mystery. Calamity at the Continental Club was a mixture of mystery and a great reminder of the beauty in D.C. I thoroughly enjoyed reading this book and meeting Kit.” Read more…. “Each story in this series tops the last, all 3 are great reads. As before Colleen Shogan’s knowledge of D.C. shines brightly in this story and again I didn’t want the story to end even though I loved the ending.” Read more…. “With a mystery that doesn’t stop, enjoyable characters, and the perfect setting, Calamity at the Continental Club is just the book to get lost in for a few hours. Once you start reading it, you won’t want to put it down.” Read more…. 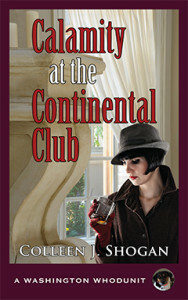 “I totally enjoyed Calamity at the Continental Club, a well-written whodunit. The author takes the reader on a fast ride through the streets of D.C. and visiting some of our nation’s most historical treasures. [….] If you’re a fan of good, clean cozy mysteries you’ll enjoy this series.” Read more…. “A brilliant mystery. Author Shogan knows how to hold her readers’ attention that’s for certain. Each chapter brought with it more questions, intrigue, and twists and turns. With protagonist Kit Marshall becoming braver with each book, she took some chances that had me holding my breath. This fast moving, from cover to cover read, leads to a great reveal and a very satisfying conclusion.” Read more…. “The book truly began to pull me in when Kit found Grayson Bancroft’s corpse as that was the moment when the book became more mysterious and less dramatic. The murder and the subsequent investigation were kept mostly clean, which was a nice change from the over use of violence and gore in most murder mysteries. Overall, I enjoyed this book.” Read more…. “I enjoyed the fact that it was more of a puzzle than other mysteries I’ve read. It felt a lot like Agatha Christie’s mysteries. I’m looking forward to reading the others in the series.” Read more…. Colleen J. Shogan is a senior executive at the Library of Congress. She is a former Senate staffer who started reading mysteries at the age of six. Previously the Deputy Director of the Congressional Research Service, Colleen also teaches government at Georgetown University. For more information, click here. Doug was conked out. I dressed quickly in my exercise clothes and grabbed the room key card before quietly closing the door. I skipped down two flights of stairs and arrived at the floor where we’d had dinner the night before. As I turned the corner past an antique grandfather clock, I spotted the portrait on the wall of Gertrude Harper, the granddaughter of the original mansion proprietors. I was no art historian, but I’d read that the Vermeer-influenced Frank Weston Benson had painted the comely twenty-four-year-old at the turn of the century. The National Gallery of Art owned the original oil painting, which had been on display in prominent places such as the vice-president’s residence and the National Portrait Gallery. With no chance of acquiring the masterpiece, the Continental Club had commissioned an impressive reproduction. I’d planned to examine the portrait last night. Impressionism, even the American version, was my favorite period of art. We hadn’t lingered in the anteroom before or after dinner, so I’d given the painting no more than a passing glance. Now I walked toward the mantelpiece to take a closer look. Gertrude really had been a beautiful young woman. The websites detailing the history of the building and the club hadn’t exaggerated her enchanting smile and the long strokes used to depict her flowing white dress. She was the Continental Club’s Mona Lisa.